Some of the core values of Florida State University are Dynamic Inclusiveness, Responsible Stewardship and Engaged Community. Surely these values can apply the support of refugee resettlement programs and the welcoming of refugee to a university community. 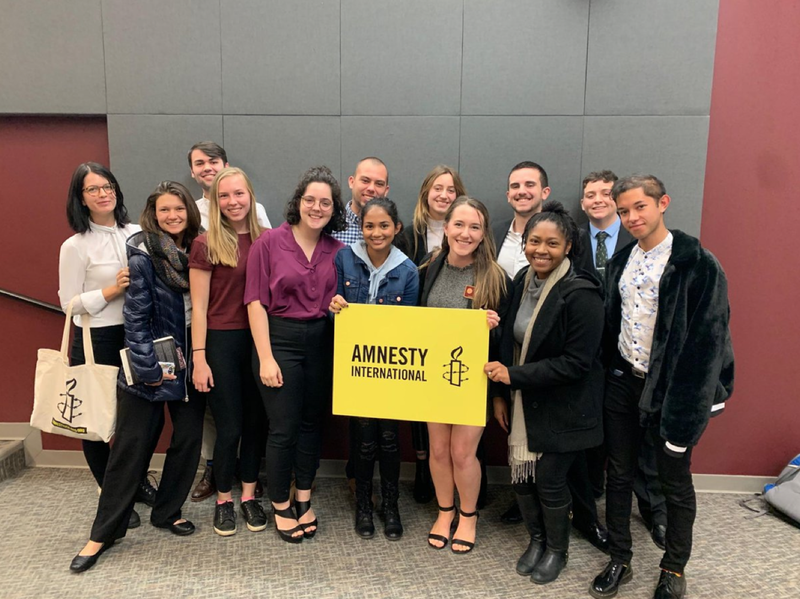 The members of the FSU chapter of Amnesty International USA believed that passing a student resolution would serve as such an intentional effort to create that sense of belonging. Despite dwindling rates of resettlement state and nationwide, in 2018, Tallahassee, home to the students of FSU and the state legislature, resettled the highest number of refugees in the state of Florida, some of whom may one day wish to enroll in higher education. Many students at FSU engage with these families whether it be with the parents who often work on campus, or with the children in English and math tutoring services. Our student group believed that being complicit to the xenophobia in the country and the cuts to these programs would only continue to hurt the refugee population in the state, which has already witnessed a closure of the refugee resettlement office in South Florida. The process actually took two semesters. Our group found a sponsor of the bill, but it wasn’t heard by any committees until the following semester months later. However, the delay may have actually been a positive thing — because the resolution passed just as Florida saw its new Governor take his oath of office. After making our statements in support of the resolution on the student senate floor, we received a nearly unanimous vote in favor — only two senators abstained from the resolution. Fortunately, we made compelling enough points in favor of the resolution with a long list of names in support at the hearings. While we were told there could be some skeptical voices in the audience, we were welcomed by a large majority of the student senators who were glad to see the student body actively contributing to making our campus more inclusive. What we’re hoping for now is a message back from our university president in response to what our student body had to say. National, state, and local politics that produced a lot of recent anti-refugee rhetoric seemed to be another hurdle we may have faced. However, these obstacles were all the more reason why our student group knew that passing a resolution would be powerful. Florida State University has a strong presence in the capital of the state and in the South East. Passing a resolution and sending message to a broad audience of decision makers could yield potential changes to support refugee resettlement programs and efforts to protect migrant rights. The student body at FSU is one which cares for all in the community, it just took a little bit of activism to codify!